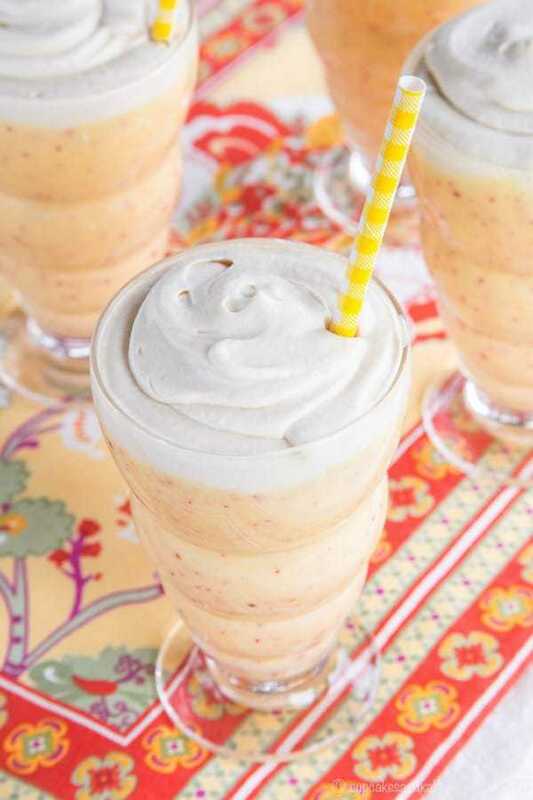 Add fresh peaches to the traditional Indian drink for a cool, creamy, healthy snack or dessert! Baskets and bushels are overflowing at your local farmers’ markets, and fruits and vegetables from your CSA are piling up. It’s time for a Farmstand Foods #SundaySupper. 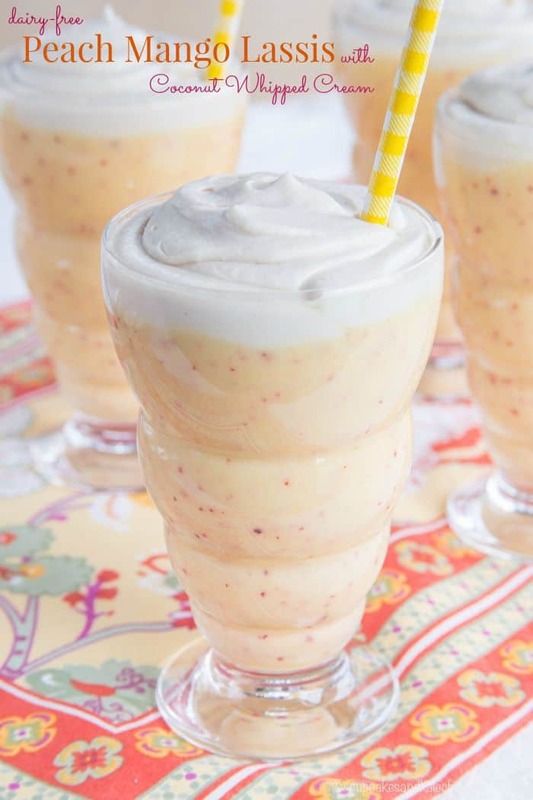 Local produce meets international inspiration in a healthy treat with these creamy and fruity Dairy-Free Peach Mango Lassis with Whipped Coconut Cream. Currently: It’s 12:21 am. On Sunday. Yes, the day you are seeing this post first appear on my site. And all I can say to you is that you should never question my dedication to my work. Yes, I make food and photograph food and write about food and Facebook about food and Tweet about food and Pin food, and yes, this is actually my job. But here it is, basically the middle of the night, I’m sitting on the floor of a hotel room in a dress with a sleeping roommate while shoving a gluten free cupcake in my mouth trying to get this post ready because I haven’t skipped posting a new recipe on a Sunday in, like, a year and a half. And while I toyed with not posting at all, I couldn’t bring myself to do it. This is after I spent the day building brand relationships, leading a pretty rock star panel discussion (if I do say so myself) at the Food & Wine Conference, networking with my fellow bloggers (aka catching up with friends, but when your “colleagues” live all over the country, you only get to see them maybe once or twice a year, and I love love love them all, I’ve gotta chit chat and hug and all of that good stuff), and yes, even made sure my tablemates didn’t touch the Certified Angus Beef until I stood on a chair in ballroom in my dress to get the perfect shot to share the awesomeness of the brand I am representing this weekend. But take this all as a little tongue in cheek (it is the middle of the night). It is work, but it’s work I love to do. It’s fun work, and I’m blessed to call it a job and to have such awesome friends with whom I get to navigate the waters of this funny blogging life. 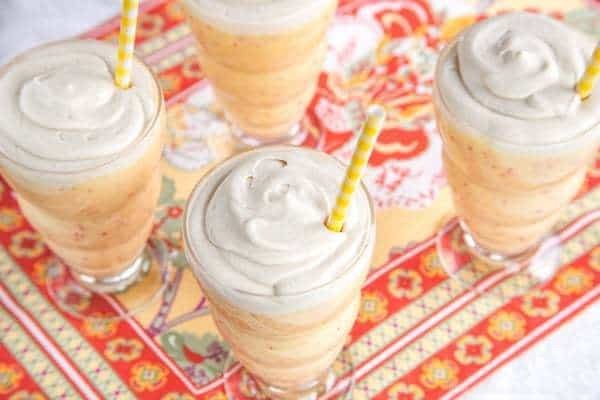 There may not be any milk or yogurt or cream in these Dairy-Free Peach Mango Lassis with Whipped Coconut Cream, but these babies are rich. Obviously the trick is coconut milk, right? I know that a mango lassi is usually made with yogurt, but I had these cans of coconut milk calling my name, I was dying to make coconut whipped cream again because, you guys, so good. And I mean, if the whipped cream was dairy-free, I might as well make the whole thing dairy free because, again, coconut milk, you guys, so good! I added a pinch of cardamom, just for fun, but it’s not critical. I also used low fat coconut milk in the lassi itself and it was already pretty thick, so if you use full fat, you may need a bit of almond milk or water to thin it out. You can also add some ice to make it a bit frostier. 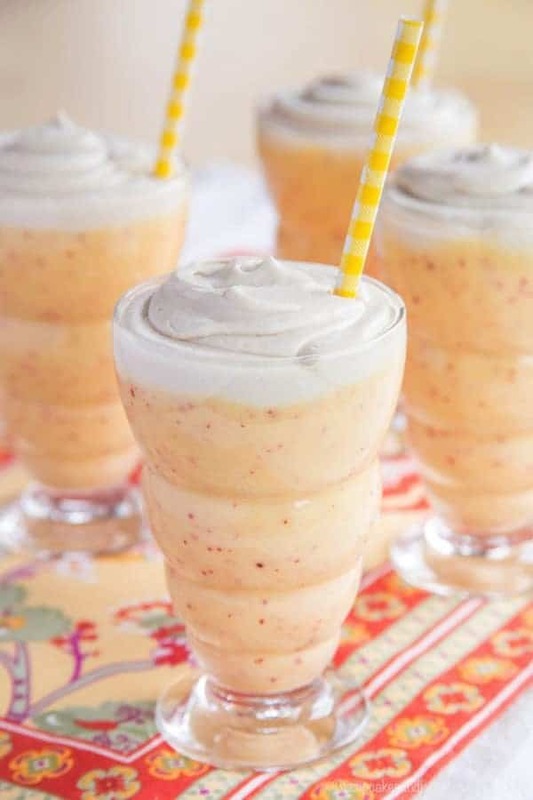 But whatever you do, grab some peaches from the farmstand and make this drink. 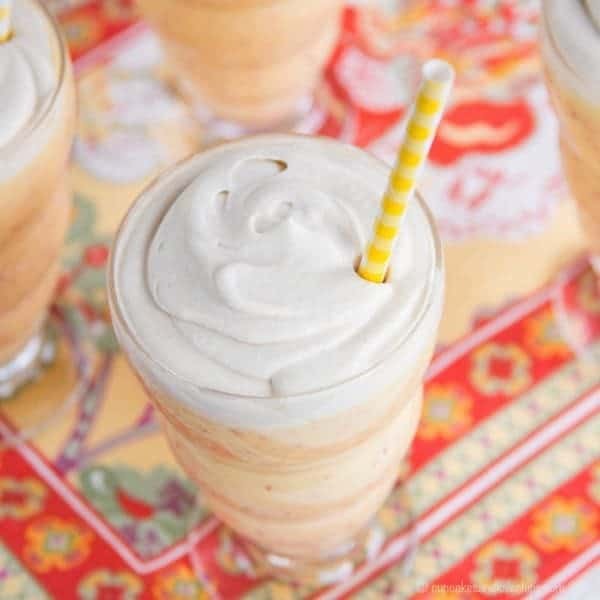 This kids thought it was a dessert milkshake, but it’s still so good for them! 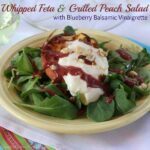 And more recipes for all of your Farmstand Foods at the bottom of this post. Have you ever pulled an all-nighter? 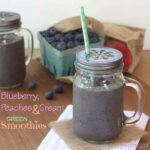 Combine the ingredients in a blender and blend until smooth. Refrigerate until ready to serve. Pour into four glasses and top with whipped coconut cream. Carefully open the chilled can of coconut milk and scoop the solidified cream out into a bowl, leaving the liquid behind (this can be used in smoothies or for thinning out the lassis, if desired). Add the sugar and cardamom, if using, and whip with an electric mixer (I like to use the whisk attachment) or whisk until soft peaks form. Serve in top of the lassis. If you use full fat coconut milk, you may need to thin out the lassis with a little almond or other milk, or the liquid left from chilling the full fat coconut milk used to make the whipped coconut cream. Oh, I want this right now! I’ve become addicted to dairy free coconut ice creams by So Delicious, and just know I’d love this!! These are beautiful lassis! I absolutely love the pictures of everyone taking pictures of that incredible Saturday night dinner. It was incredible and we have the pictures to prove it! It was so great to finally get to meet you at the Conference! Sounds like you had a good time at the Food & Wine Conference, and these lassis are just gorgeous! 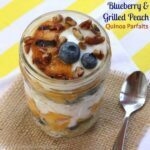 I love that you put peaches in them (they’re my favorite) 🙂 I’ll definitely be making this soon, as it looks like an excellent way to cool down in this awful heat! After sampling that Georgia peach smoothie this weekend, I’m all about peach drinks. Your lassi looks incredible!! SO good to see you again!! !